Here is something that I do not imagine will come as any great shock to you, dearest reader: I am not at all knowledgeable in an overwhelming majority of the facets of figure skating. I know the equipment – a sheet of ice, a pair of skates and a warm-blooded person of distinct nationality in a skintight representation of an eighteenth century romance novel – I know a handful of names – Kristi Yamaguchi, Michelle Kwan, Johnny Weir, Tara Lipinski, Nancy Kerrigan, Nancy Kerrigan’s problematic attacker who now has her own movie, for some reason – and far fewer but non-zero number of jump names, like the triple axel and the Salchow, and that’s where it ends. But on Thursday night, as happens every four years, I took in the sport in all its glory, as the men’s short program from Pyeongchang hit primetime. Expecting to see the crowning of two-time American champion and team bronze medalist Nathan Chen, or the pyrotechnic flair and on-camera joyous irreverence to which we’ve grown accustomed over the past two weeks from fellow American Adam Rippon, I was instead treated to the comeback performance of the quadrennial and a Winnie the Pooh hailstorm. Say it with me, the new Pledge of Allegiance in its ubiquity and omni-timeliness: this has been a dreadful, terrible, frustratingly mind-numbing week. This one in particular has tested the will and resilience of Americans, who struggle to continue fighting toward some normalcy, some peace, relative decency in a society where the relative implies a warped standard awaits, no matter the outcome. The state of, well, everything in this country – with its constant fire alarm of a news cycle and the blandness of responses to it from people with any real power – obscures the beauty of things both simple and complex. You’d be forgiven for forgetting that the Olympics were even on right now, between the firestorm of responses-to-responses from your relatives and their friends on a factually-incorrect meme and the generous time difference between most of the U.S. and South Korea. The primetime broadcasts have bridged quite the gap. Thursday’s skating showcase was no different. The typical NBC broadcast goes something like this: introduction of an event; a heart-wrenching, five- to seven-minute profile of the American involved in the event; a few runs of an event, while panning to the American to remind you that they exist; the American’s run in the event. Fresh off a team bronze medal, the American hero of the men’s individual skating competition was supposed to be Nathan Chen, the eighteen-year-old who is the only person skating with five different types of quad jumps. Like his teammate, the skier and 2014 gold medalist Mikaela Shiffrin, Chen was poised for a breakout, groomed by the American media as the next-Greatest (The Title of a Person Who Competes in Your Event) Ever. Unfortunately, like Shiffrin at these Olympics, Chen cracked, never establishing anything that looked like momentum on his way to a disappointing 82.27, placing 17th in the standings. What may have thrown Chen off was the performance which immediately preceded his: that of defending gold medalist Yuzuru Hanyu, whose technical precision and ability to change speed and direction on a dime has already led to two World Championships and four Japanese national titles. He is coming off an ankle injury in November which kept him sidelined for two months and allowed the slightest bit of doubt about his presumptive gold medal status to blossom. It took just over three minutes for Hanyu to erase that doubt. My lack of familiarity with the subject matter, combined with its all-time excellence, merits seeing it in full. This performance is said to have taken place on Thursday night, but given how damn long everything feels now, it could’ve been from 2016, or 2014, or 1998, or, being that I now feel 900 years old and age a century with each NPR news update, during the dying breaths of the Liao dynasty. 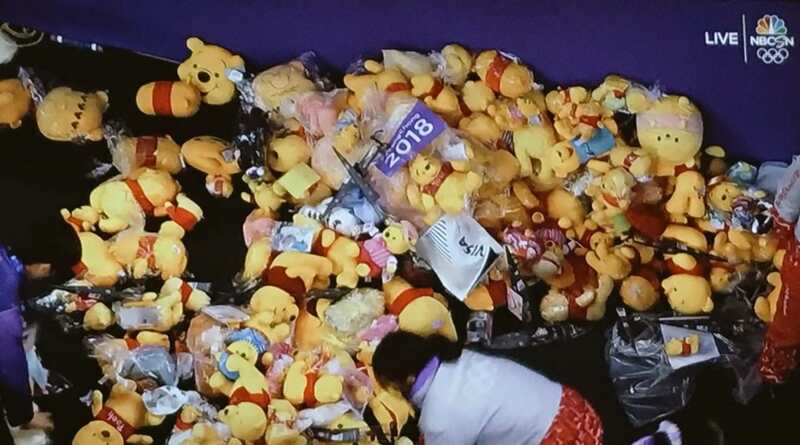 The audience inside the Guangneung Ice Arena celebrated Hanyu’s greatness with, predictably, a standing ovation and, far less predictably, by showering him in Winnie the Pooh stuffed bear dolls. Hanyu is said to be an avid Pooh fan, which is just the most delightful extracurricular pursuit. It is beautiful; I wept. I can’t tell if knowing nothing or knowing everything about the performance would enhance or detract from it, which, being the state of the former, leads me to believe it’s neither. In other words, I believe this to be objectively good, and, in delivering a score of 111.68 to the 23-year-old maestro, the judges seem to as well. Tonight, Friday, at 8 p.m. Eastern, six-thousand millennia from now, Hanyu will compete in the long program portion of the individual skating event. It is must-watch television in a sea of must-watch television, a welcome respite from the rage-inducing white noise elsewhere, such as that which suggests LeBron James is worthless as a human being aside from his ability to dribble a basketball. As with the United States itself, I remain hopeful that Nathan Chen will recover. He is only 18, which is essentially 242 in nation-age years, so a little rattling of his cage at this point shouldn’t do too much harm. For inspiration, he can look to the man five years his elder, a genius with an affinity for an illustrated-turned-stuffed yellow bear, inexplicably wearing a red shirt and pants-less. Yuzuru Hanyu is for Japan, and for all. Thank you, NBC broadcast and Wikipedia.